EDITOR’S NOTE: In July 2010, Christian Oesch of Utah, and Kenneth Wayne Leaming of Spanaway, Wash., sought to sue the United States — apparently for the staggering sum of more than $29 trillion — for its actions in the AdSurfDaily Ponzi forfeiture case brought by the U.S. Secret Service in August 2008. The Secret Service described ASD as a “criminal enterprise” operated by Andy Bowdoin, a 77-year-old recidivist con man. Leaming, a 56-year-old purported “sovereign citizen,” was arrested by an FBI terrorism task force in November 2011 on charges of filing false liens against at least five public officials involved in the ASD case. A superseding indictment was returned against Leaming earlier this year. He remains jailed at a federal detention facility near Seattle. A September trial date for Leaming has been set in federal court in Washington state, the venue from which he allegedly filed the false liens and committed other crimes such as harboring fugitives and possessing firearms as a convicted felon. Judge Christine Odell Cook Miller of the U.S. Court of Federal Claims ultimately dismissed the lawsuit brought by Oesch and Leaming, saying in December 2010 that the “complaint deteriorates into rambling.” Earlier — in July 2009 — Oesch had sought to intervene in the ASD case and set aside the forfeiture of tens of millions of dollars in the personal bank accounts of Andy Bowdoin. Like Leaming, Bowdoin is scheduled to go on trial in September. Bowdoin’s trial will be conducted in the District of Columbia. Oesch, known to have business ties to Leaming, has not been accused of wrongdoing in the ASD case. U.S. District Judge Rosemary Collyer of the District of Columbia — later allegedly targeted by Leaming with false liens — denied standing to Oesch and numerous other pro se litigants in the ASD case. The ASD case has been marked by strangeness, including pro se court filings that accused Collyer of treason and operating a “Kangaroo Court.” Oesch accused Collyer of interfering with commerce, arguing that the judge and federal prosecutors also were guilty of “Anti-Trust Violations” and “Criminal RICO” violations. That same type of language now is being used by Oesch in his responses to a January 2012 lawsuit in Utah in which he was named a defendant by mortgage giant Fannie Mae . . . Using the same street address in Midvale, Utah, that appears in court filings in the civil-forfeiture portion of the AdSurfDaily Ponzi case, ASD figure Christian Oesch curiously declared himself a “Fiction & Transmitting Utility” in his response to a lawsuit in which he was named a defendant by the Federal National Mortgage Association, the PP Blog has learned. The U.S. mortgage giant commonly known as Fannie Mae initially sued Oesch, Becky Oesch, Michael A. King and two alleged “Doe” occupants of a home on South Wayside Drive in Sandy, Utah, in January 2012. The complaint was removed to federal court in Salt Lake City in February, but now has been kicked back to Utah state court, according to court dockets. Oesch, who once claimed that U.S. District Judge Rosemary Collyer and other public officials involved in the ASD case were guilty of racketeering and antitrust violations, now has essentially accused Fannie Mae of the same thing. “Securitization is illegal under US legislation — primarily because it is fraudulent and causes specific violations of R.I.C.O., usury, Antitrust and bankruptcy laws,” Oesch argued. Oesch went on to argue that “US authorities from the highest level downwards, financial institutions, intermediaries, Intelligence Power operatives and others are gearing up for what they doubtless hope will be intensified racketeering and trading activity with (corrupt) foreign counterparties. “This behavior is being fine-tuned ‘as we speak’ . . .” Oesch ventured. 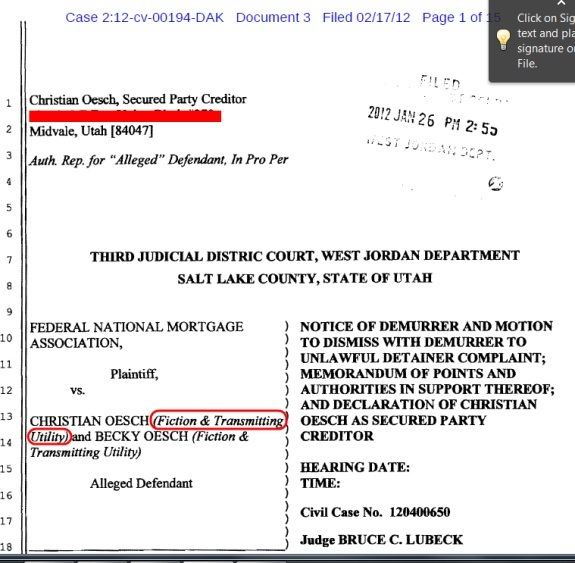 ASD is not referenced in the Utah complaint against Oesch and the others. Filings suggest, however, that Oesch lived at one time in the Sandy house that is the center of the case. Fannie Mae is seeking treble damages for an alleged failure of the defendants to vacate the property when requested. WOW! Fanie Mae … Fannie Mae is the biggest ponzi scheme along with Fredie Mac put together by the government. YOU THINK THESE GUYS ARE LEGIT!!! OMG ..there goes your credibility again. You are bought for … total looser and liar too … Good day sir! I agree with you. Patrick Pretty boys and girls aren’t that pretty at all, they are all part of an undercover Zionist Neocon Cabal that is sucking up and making up the World Elite, while supporting their criminal activities and trying hard to make them clowns look good. The real folks with brains have long figured out that the people of America are getting hosed, and that DC is the most wicked town in the World today and so are all those agencies that are part of those false flags and black ops. So Patrick Pretty and its entire team are nothing but paid off sidekicks and working for the Cabal that is exploiting the people across America, then who has time and who is making a living posting defamation, slander and cause libel on the innocent people that take a stand against those NAZI’s running America today! beau: WOW! Fanie Mae … Fannie Mae is the biggest ponzi scheme along with Fredie Mac put together by the government. YOU THINK THESE GUYS ARE LEGIT!!! OMG ..there goes your credibility again. You are bought for … total looser and liar too … Good day sir! I would like to apologize to everyone, I haven’t mentioned David Icke for a few weeks. How remiss of me. (a) the UK government (b) a shadowy Bilderberg hyper-capitalist neocon cabal (c) the CIA (d)M15/6 (e) Israel (f) Jews, somewhere, (g) possibly an elite part-reptilian super-race. And here we see another standard conspiracy theorist tactic. Deflect with whataboutery, fail to answer questions, fail to deal with points raised, leap from specifics to general. Same tactic used many times by ponzi players & supporters. Much as I dislike the terrible mess and bank led evictions arising out of the sub prime mortgage scandal,and as appalled as I am at the present lack of criminal prosecutions of the perpetrators, I can’t see what that has to do with our friend Christian Oesch’s conspiracy theories. With his background, he just doesn’t fit the pattern of the innocent victim. On this occasion, my sympathies are with Fannie Mae.